As you may have heard, California is recovering after a rash of deadly wildfires that forced a state of emergency in Los Angeles County last month and killed dozens up north. But with tragedy comes hoaxes. 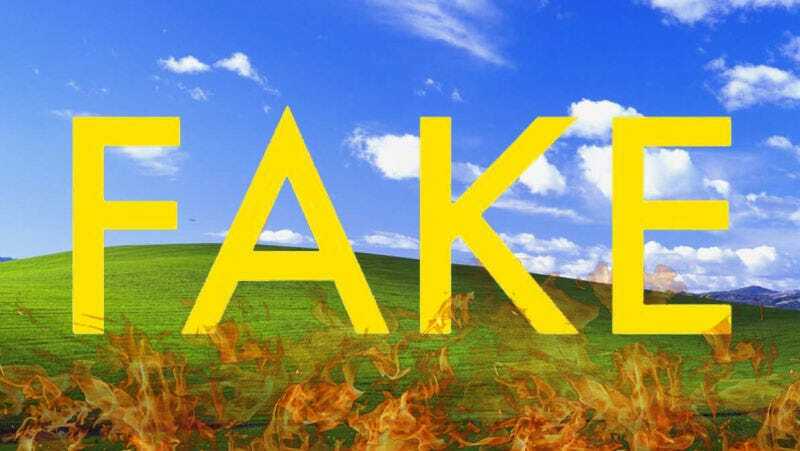 And though a jaw-dropping image of men golfing near an inferno in Washington last month was real, claims that the hill from the Windows XP desktop background is burning are a big, fat lie. Last night, a photoset titled “The ‘Windows Hill’ is on fire in California” began circulating on Imgur, followed soon after by viral posts on Twitter and Reddit. The images purported to show the Sonoma County hill made famous as the subject of Bliss, the default wallpaper for Windows XP, engulfed in flames. But while the Nuns Fire and nearby Tubbs Fire raced through wineries near the famous hill’s real-life location earlier this month, a public information officer attached to the Tubbs Fire told Gizmodo that there are currently no active fires in Sonoma County. Dispatched fire teams are now tasked with venturing into more remote areas to check for hot spots. As a landmark of sorts, the Bliss hill also has known geographic coordinates (38.250139, -122.410806), making it easy to check its location against the State of California’s fire map. According to the most map’s most recent update from October 21st, the Nuns fire neared but did not hit “Bliss.” Based on all available information, it appears the hill was not affected by the fires, although we’re waiting to hear back from the owners of the land to confirm. Given that much of the “Windows XP hill is on fire” story is complete hogwash, it’s natural to assume the third photo from the Imgur set is some anonymous hill burning at some indistinct time with no relationship to Sonoma County’s recent fires. Wrong again! Though the watermark has been (rudely) cropped out, the image’s origins clearly trace back to the Twitter account of self-described “contemporary romance author” Kate Kisset. On October 9th, Kisset posted the photo allegedly shot somewhere behind the Gundlach Bundschu winery, just a five minute drive away from the famous hill. While this particular incident may be fabricated, the California wildfires are very real, and have caused immense damage to agriculture, property, and have cost dozens of residents their lives. Those unable to volunteer can refer to the CaliforniaVolunteers list of preferred charities.